EL MONTE – El Monte High School special education teacher Raelene Felix has been recognized with the Exceptional Special Education Teacher Award by the West San Gabriel Valley Special Education Local Plan Area (SELPA) consortium for her tireless advocacy on behalf of special education and for her dedication to her students’ academic and socioemotional success. Felix works with students in the Career Skills Prep Academy (CSPA), established in 2014 at El Monte High School to assist students with mild to moderate disabilities who are not on track to earn a diploma and are not meeting core standards. The program serves 11th- and 12th-grade students from across the District, providing work experience and community service opportunities to support their post-secondary futures. The program focuses on functional skills, such as academics, independent living, self-advocacy and consumer math. After completing the CSPA program, students may continue their education at the Adult Transition Center. “Ms. Felix is a perfect example of an educator who goes above and beyond to make students and their success her No. 1 priority, and we are honored to have her be a valuable member of our team,” Superintendent Dr. Edward Zuniga said. 101218_EMUHSD_FELIX: El Monte High School special education teacher Raelene Felix was honored with the Exceptional Special Education Teacher Award by SELPA. She is pictured with instructional aide Gabrielle Almazan, left, and former students William Hunter and Damian Lomeli. El Monte High School special education teacher Raelene Felix was honored with the Exceptional Special Education Teacher Award by SELPA. 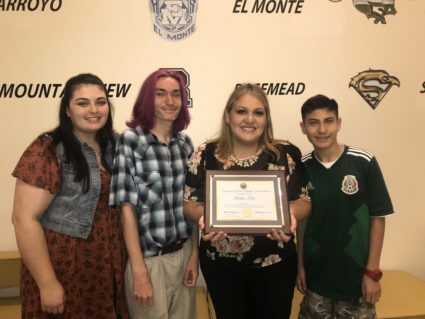 She is pictured with instructional aide Gabrielle Almazan, left, and former students William Hunter and Damian Lomeli.